From sometime in the early 1970s to May of 1981, there existed a remarkable little radio station in Cambridge, Massachusetts. It had only 250 watts of power; it was AM; and it had to sign off the air at sunset. By those measures, it was the least among the dozens of Boston-area radio stations. Yet, many people recall it fondly to this day. This page is maintained by Dan Murphy. Email dan. June, 2013: Seven more signoff added to the rotation, thanks to David Luster. Internet Radio Stream. Our core is acoustic and urban folk music from the 60s to the present, plus rare tracks straight from vinyl. Hosted by Dan Murphy, formerly of WCAS, Cambridge, WATD, and New Hampshire Public Radio. 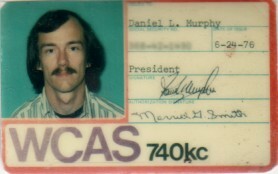 The format for which WCAS became known and which so many people wanted to "save" evolved into being in the early 1970s during the time that Rick Starr was program director. In his recollections of those years, Rick gives generous credit to several other staff members for the end result. It is those recollections which prompted the creation of this page, and they may be found here. As a station licensed for daytime broadcasting only, WCAS had to signoff each day at around sunset. The exact time for each month was specified in the station's license, and during the winter months, that might fall right in the middle of afternoon drive time. Sometime in the early 1970s, a number of humorous signoff productions were created to provide an alternative to the usual boring announcement and playing of the national anthem that had been customary on stations large and small back to the beginning of radio broadcasting. There have been more requests for those signoffs than for any other bit of past programming, both before and since this web page was created. So here finally, on September 12, 2009, we present the WCAS Daily Signoff. Today's signoff: SEGMENT Go Now Quickly, Dearest. Just like in the old days, it will be different each day. On March 19, 1976, the ownership of WCAS officially changed to Wickus Island Broadcasting Corp. During the preceeding 3-4 years, the station had twice been scheduled to be sold to owners with plans to use the station for religious broadcasts. Comments from community groups were filed with the FCC protesting the prospective format change, and the FCC delayed approval of the sale until the prospective buyers withdrew. With the completion of the sale to Wickus, that particular threat subsided. On the morning of March 19, 1976, Rick Starr signed the station on the air, noted the change of ownership, and played a most interesting song to begin the day and the years of Wickus management. Click here for the WCAS signon of March 19, 1976. Later that morning, the "music news" was preempted for a summary of the history and sale of WCAS. The segment was produced by Rick Starr and includes an interview with the new owner, Dan Murphy. "On the Outside" - prison program; discussion of living conditions, prison reform, rehabilitation, legislation. Produced by Self Development Group, Boston. "Point of View" - interview and discussion by political leaders and newsmakers. Produced by Neila Smith, WLVI, Boston. "Boston Folk Scene" - music and talk from local musicians. Produced by Jim Chevallier. "Peacework" - 3rd world, liberation, and freedom discussion. Produced by Arthur Fink, American Friends Service Committee, Cambridge. "Black Light" - black and other 3rd world discussion; interviews, music, news. Produced by Toni Lewis. "Closet Space" - gay program; news, calendar of events, skits, interviews. Produced by Ellen Davis, Gay Community News. A state of emergency was declared in Massachusetts for a week while we dealt with, among other things, hundreds of cars abandoned on Rt 128 and other roadways. It also provided a unique experience for WCAS staff and listeners for that week -- the station was on the air at night, a practice allowed by FCC rules in times of emergency. The staff worked long hours, and volunteers came in to help gather and organize local storm-related information. Pete Stassa has provided several hours of off-the-air recordings of the station during the emergency. Part 1, Part 2, Part 3, Part 4, Part 5, Part 6, Part 7, Part 8, Part 9, Part 10. A brief excerpt from "Reggae Bloodlines" hosted by Peter Simon. Peter showed up at our door one day offering to do a reggae show. It didn't hurt that his sister was Carly Simon, so we signed him up for "Reggae Bloodlines", a one-hour slot on the weekend. 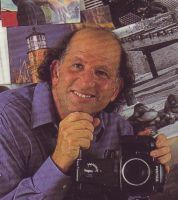 Peter was also a contributing photographer for the Village Voice, the Phoenix (Boston, Cambridge), Rolling Stone, and others. To date, he has published ten books, including "Reggae Bloodlines" and his latest, "I and EYE". On January 1, 1980, WCAS broadcast the "WCAS TOP 74" songs of the 1970s as ranked by WCAS listeners and staff. During December, WCAS asked listeners to vote for their favorite 5 WCAS songs. From several hundred responses, plus staff input, we compiled this list of the WCAS TOP 74 and counted down the entire list on January 1. At the conclusion of the TOP74 countdown and just before signoff, we credited the many WCAS staff members who had added their talents and efforts to the station up to that moment. Click here for the audio. Some of the air personalities from WCAS continued to bring music in the WCAS tradition to the airwaves. Here are a few I know of. Tell us if you know of others. Joan Orr did shows on WBOS, WUMB, and some other Cape Cod stations and for many years did "Something Different" on WATD, Marshfield, MA. WUMB has been playing folk/acoustic music in the Boston area for many years. A part of UMass Boston, they have been known to describe the station as carrying on the legacy of WCAS. Frank Dudgeon as well as Joan Orr have turned up there since their WCAS days. WERS, Emerson College, Boston, picked up and carried Live At Passim for several years. Yours truly, Dan Murphy, hosted The Folk Show on New Hampshire Public Radio in the early-mid 1990s and spelled Joan Orr at WATD occasionally from about 2000 to 2006. Right now, I'm doing folk and acoustic music on internet radio at The Acoustic Outpost. Do check it out! Bill Goldsmith, PD of WCAS circa 1979-80, has been doing internet radio for over 10 years! He was a pioneer. Check out the station at RadioParadise. "Somerville" by David Misch. What else is there to say? This site is new as of August 18, 2004. Much history will be added in the future. For now, enjoy this collection of bumper stickers and t-shirts spanning the lifetime of WCAS. For email notice when updates are made to this site, subscribe to our email list. If you have memorabilia or recordings of WCAS to share, we would love to add them to the collection. Let us know.